Anathema were formed back in 1990 in Liverpool (the home of the Beatles) and have released 11 studio albums starting with Serenades in 1993 and so far ending with Distant Satellites in 2014. They have also issued 2 live albums, the second of which is reviewed here. This release, A Sort Of Homecoming, was recorded live at the end of a short acoustic tour in Liverpool Anglican Cathedral on 7th March 2015. The band comprised Vincent Cavanagh (vocals, guitar, vocoder), Danny Cavanagh (guitar, keyboards, vocals), Jamie Cavanagh (bass), John Douglas (drums, keyboards) and Lee Douglas (vocals) with a couple of guests contributing to some sections of the concert, David Wesling (cello) and Anna Phoebe (violin). As well as being released as a double CD, the concert is also available as a DVD, Blu-ray and a triple vinyl album. The CD contains 2 discs with a total of 15 tracks, 8 on disc 1 and 7 on disc 2. The package has a total playing time of around 102 minutes with disc 1 being the shorter of the two discs by around 2 minutes, disc 1 having a running time of 50:13 minutes and disc 2 clocking in at 52:07 minutes. The band take the songs from 6 of their albums with the emphasis on the newest 2 releases, Distant Satellites (5 tracks, 2014), Weather Systems (4, 2012), We’re Here Because We’re Here (2, 2010), A Natural Disaster (2, 2003), A Fine Day To Exit (1, 2001) and Alternative 4 (1, 1998). The opening track on A Sort of Homecoming is “The Lost Song Part 2” (6:39) from Distant Satellites and, as this was an acoustic tour, accompanying the vocals of Lee and Vincent, is a simple acoustic guitar (played by Danny Kavanagh?). This is then followed by “Untouchable Part 1” (6:29) and “Untouchable Part 2” (6:25) both from the Weather Systems album. The treatment of these songs is very sparse in comparison to the studio versions and the beautiful vocals make the trio of tracks very powerful. All in all, this is a very good start to the proceedings, and that view is backed up by the sound of the appreciative audience. For the last 3 tracks on the first disc, John Douglas, David Wesling and Anna Phoebe join proceedings and “Anathema” (7:32) and “Ariel” (6:08) tend to mirror their studio versions on Distant Satellites more closely before the vocals are taken by Danny Cavanagh for the final song on disc 1, “Electricity” (4:31) from A Natural Disaster. The opening track on disc 2, “Temporary Peace” (5:15), continues the beautiful serenity that has been prevalent across the first 8 tracks. Stunning vocals from Vincent, with strings, delicate percussion and acoustic guitar, all combine to form an excellent start to the second disc. A couple of tracks later, on the title track from Distant Satellites, the band is joined by some audience participation. The whole feeling of this concert is that of a band that is truly content with their lot and is happy to show how they have evolved from their beginnings a couple of decades ago. Older numbers bring the concert to a close with “A Natural Disaster” (8:45), the title track from 2003, and “Fragile Dreams” (7:32) from the 1998 album, Alternative 4. “A Natural Disaster” is one of the first songs that Lee Douglas guested on back in 2003, as at the time, she was not “officially” in the band, and this version still highlights her powerful, emotive voice. The finale to the evening, “Fragile Dreams” is a superb closing choice with the two voices complementing each other and as the electric guitar runs follow the voices the crowd start to realize the end is close and the ovation starts. This was perhaps an ambitious project to tour on, and by that I mean, the acoustic set-up. This release, A Sort Of Homecoming, is likely to have already been purchased by fans of the band and they will not have been disappointed in any way. 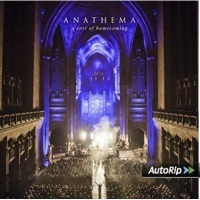 It is possibly not the best entry point for people “trying out” Anathema for the first time as it is slightly different from the studio albums. I thoroughly enjoyed this album but the one glitch on waxing totally lyrical on the album, is that I felt a slight tinge of sameness. Individually the tracks are excellent, but I felt that a double CD just stretched it a little too far. It may sound a bit harsh, but I feel that there is a really excellent single live album hiding in this double album release. Parting words, as usual, are that this is a very personal opinion and I will always suggest that people have a listen to any of my reviewed albums, as they may well feel very differently towards the music.